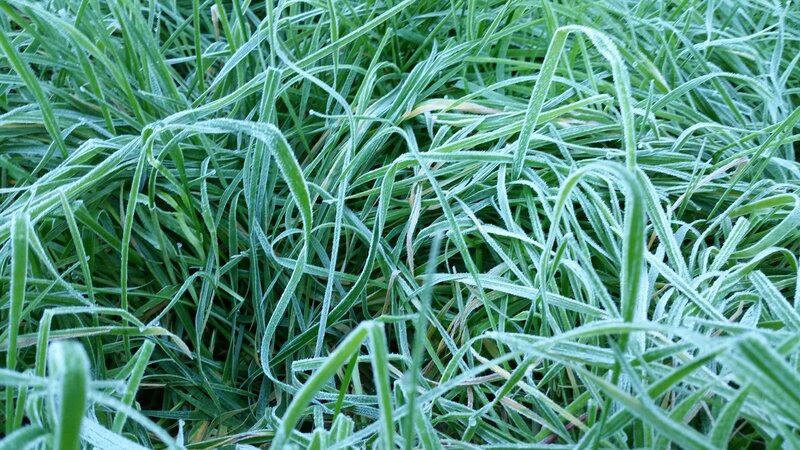 These are the cold, cold days of January when the fronts come through in the pattern of hot and sticky, silver chilly rain, and then the glittering mornings laced with frost. The rain has already come through, which is why it hardly ever snows, though it is cold enough to. It leaves a damp, chilly cold that sinks through layers of clothes and gets into your bones. Ethan came home from complaining about the snow in Chicago and realized it felt colder here in Florida, which is why i am a dedicated knitter! Most people i see out and about pull on giant, cumbersome parkas they keep in the backs of closets just for these few freezing weeks, lumbering down sidewalks behind steam-breathed dogs like plush abominable snowmen, but i have to actually work and be lively in the cold outside most of the day, and there’s nothing like layers of close-knitted wool to keep warm in damp cold. This time of the year was traditionally about half the winter – when your food and fuel should be no more than halfway consumed or else the future was awfully bleak and hungry. Unlucky for us, we are nearly out of firewood, but at least my son, really now a – gulp – young man, can help me with hauling and splitting more wood. It is interesting having a child who is taller than you, especially because he is interested in all the things i really don’t like very much (and it is a fairly short list) – fancy cars, sports, guns, the military, and body building. Sometimes I wonder how that could have happened, but then i think its probably fairly normal to be interested in things your parents can’t stand. The problem i think is that people take teenagers too seriously. They think that because they like [fill in the blank] they will ALWAYS be that way, and it will lead to unhealthy life habits, and it will all turn out to be terrible. I still remember how condescending adults were to me when i was a teenager, and yet i think if young people are allowed to learn about things for themselves, they find out not just the side of things they see with stars in their eyes, but the dark side of things too, and it’s an important perspective. The kids that i can think of who got stuck on things in an unhealthy way were often the kids whose strict parents wouldn’t let them be interested in something. Everyone else grew out of whatever they liked when they were 14, but they got stuck in it as adults, having this unexplored passion while everyone else was on to something new. In any case, i am really appreciating having another grown up sized person around, as well as our funny and interesting conversations lately. There are so many beautiful vegetables in the garden right now, every frost gives me anxiety in case they are killed. This last frost i woke up at dawn to run the sprinklers. The garden was all stiff and dark with ice. By the time the sun had risen over the tree line at 9 am, i turned them off and went to harvest kale. The leaves crumbled in my hands. They were covered with sheets of ice because it was still below freezing. I turned the sprinklers on again for awhile to melt it, and everything still survived. This bunch of greens is Maruba Santoh, a tender Asian mustard green that reminds me of the Tokyo Bekana. From left – Purple Dragon, Pusa Rudhira (i saved the seeds. They will get much larger, this was pulled too early), Oxheart (will also get much larger), Lobbericher yellow (seeds from Baker Creek. 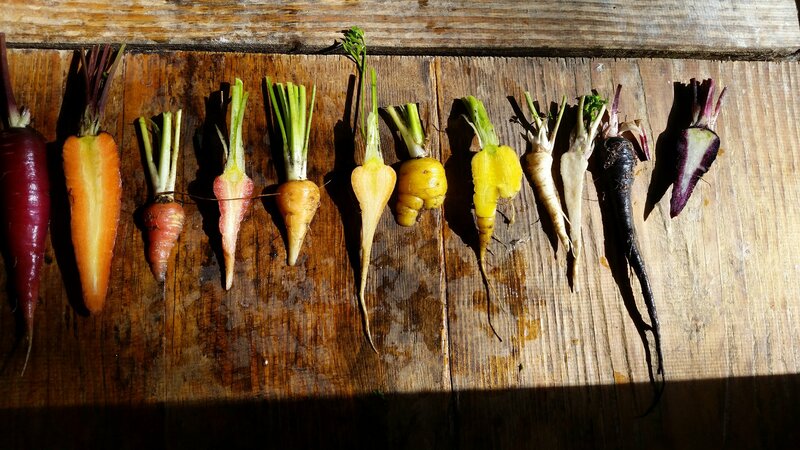 This was a very stumpy one but they have been mostly long and much larger), the white one isn’t actually a carrot but Hamburg Rooted Parsely from Adaptive seeds – very interesting flavor! And last of all Pusa Asita from Baker Creek. 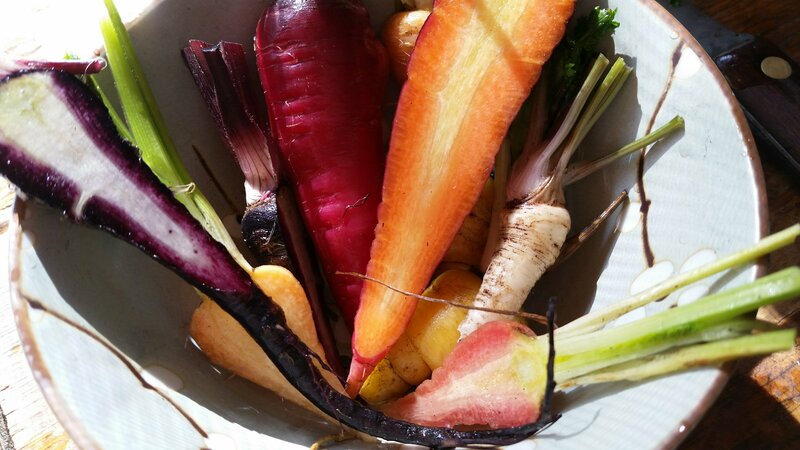 Most of those carrots have turned out short and rooty this year and i was not really happy with them, but the color is very striking and beautiful. This soup worked great to ward off another cold this damp and chilly week. It was quick to cook with our limited firewood, and made good use of some leftover meat from a chicken roast that had gotten dry and untasty in the fridge. 1. Sautee onion in the fat and let it cook until it becomes sort of transparent rather than white. 2. Meanwhile, chop up carrots, turnip, and radish and add to the pot along with the coconut milk and broth. Add the meat and the garlic chive. 3. Scatter chopped mustard greens on top, and add the Calamondins sliced in half and the grated turmeric root. Season with salt and pepper and put a lid on top and leave it to gently cook until the root vegetables are soft. 4. Just a minute or so before you take it off the stove, scatter the chopped cilantro on top and let it soak into the broth. It goes wonderfully with rice or noodles. When I grew citrus trees back in the early 1990s, we grew both calamondin and variegated calamondin trees. They were surprisingly popular here because of the Filipino Community. However, outside of that community, not many of us know what they are, or what to do with the them. The trees are so pretty. Now that I do not grow them, I do not know where I could get any of the fruit. I’ve never seen the variegated ones, that sounds beautiful! I don’t actually have a tree myself, but they are often planted in yards and no one likes them because they aren’t a sweet citrus, so you usually can ask and get as many as you want! I like their flavor better than lemons. It’s a very cold micro climate out where we are, so i haven’t been successful at growing any citrus, but I’ve been thinking of getting a few trees i can cover during the cold weather. I sort of think that the variegted calamodin looks a bit pale, although it looks nice against a dark green backdrop. We grew so many that it seems like there should be many about town. Yet, there are just a few, and they are not in my neighborhood. The old fashioned ‘Marsh’ grapefruit is one of those that is more common in gardens where the fruit is undesirable. That is how I get mine.